The future of transparency in D.C. government is murky, open records advocates say. 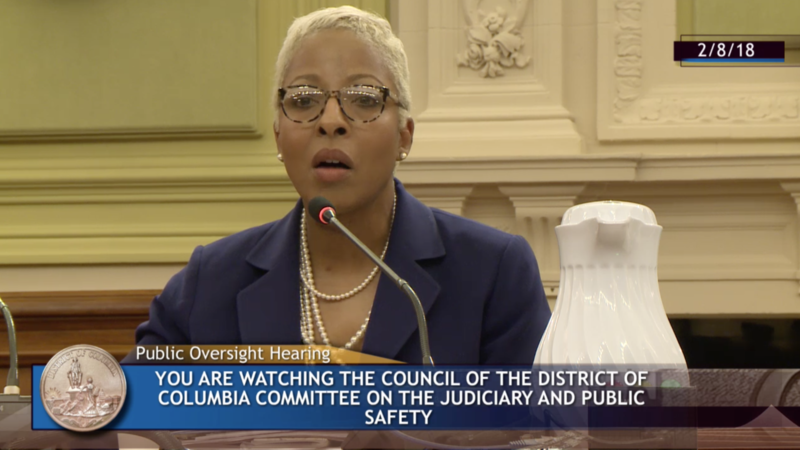 The D.C. Board of Ethics and Government Accountability – appointed by Mayor Muriel E. Bowser – voted 3-to-0 last week to not reappoint Hughes when her five-year term expires April 22. The office already faces significant hurdles, Hughes said Tuesday. Traci Hughes, the District’s Office of Open Government’s inaugural director, said D.C. FOIA laws have seen “a world of difference” in the past decade. Her office was created in 2012, and as of February 2018, her contract will not be renewed. Hughes opposed Mayor Muriel Bowser’s administration on several issues and said the move was likely politically motivated. She publicly came out against Bowser’s 2015 proposal to exempt footage from body cameras worn by police from public records requests. Hughes called it “completely counter to the executive’s professed aim of a more inclusive and transparent government,” according to The Washington Post. She also has opened cases against agencies for not complying with the Open Meetings Act, which requires them to notify the public of meetings. Hughes told The Investigative Reporting Workshop in late 2017 that she felt her office should have more authority to make sure agencies comply with FOIA. She also said with just three employees, her office didn’t have the staff to monitor each agency’s compliance. To fulfill the agency’s mandate, the office would need at least another attorney and an IT specialist, she said. Ethics and Government Accountability Board Chair Tameka Collier told Hughes that she might not be reappointed in mid-December, Hughes said. Collier and two fellow board members – Shomari Wade and Norma Hutcheson – voted not to reappointment Hughes, while board member Darrin Sobin was absent from the Feb. 1 meeting. Traci Hughes spoke at the Committee on the Judiciary and Public Safety Feb. 8 hearing about not being reappointed to her post. Bowser’s office and board members did not return calls or emails. The Committee on the Judiciary & Public Safety, which reviews matters such as government ethics in the District, met Thursday to discuss the board’s decision. Collier denied that the mayor’s office influenced its decision, but said she could not provide a reason for not reappointing Hughes, citing a personnel issue. Hughes said she wasn’t given any substantive feedback other than that she needed to collaborate with the board more. But Hughes said she had met with the board once a month for the last five years, which was not required. It will be difficult to keep District agencies in compliance with FOIA without independent action by the office, said Robert Becker, government relations chair for the D.C. Open Government Coalition, which pushes for public access to government information. If the board replaces Hughes with someone qualified, he said his hope is that the person would continue to work on government transparency. “If it’s [the new director] someone to the mayor’s liking, the office will be part of the problem rather than part of the solution,” Becker said. During her tenure, Hughes has brought more data online, she told the Workshop in December. In 2014, Hughes jump-started the city’s FOIA request data portal, FOIAXpress, which allows people to submit and track FOIA requests online. Despite the progress, many agencies still fall short of what FOIA requires, a Workshop audit found. The Workshop updated a 2010 audit it did in collaboration with the D.C. Open Government Coalition. The audit was intended to evaluate how well the District’s administrative agencies, boards and commissions are doing at posting public records required by the FOIA law. Under the law, agencies with websites must put online all public records, created on or after Nov. 1, 2001, that fall within 10 categories of information. The required elements under FOIA include such things as agency meeting minutes, staff instructions and agency rules and policies, including the Department of Police Complaints, the DC Public Library, the Department of Public Works and the Department of Disability Services. Between August and October 2017, Workshop reporters reviewed websites for 52 agencies and commissions looking for examples of required postings in eight of the 10 categories of information that the District’s FOIA law requires agencies to post online. The Workshop conducted subsequent spot checks for site updates. The two categories not included in this audit relate to the recording of real-estate transactions and building permits, areas that do not involve most agencies. The Workshop also checked whether agencies provide citizens with information on filing FOIA requests to obtain other records. The Workshop found only about 10 percent of agencies post records that already had been requested, while about half post meeting minutes. Only one of the 52 agencies posted an index of records that will be put online. Almost all agencies did include information on how to file FOIA requests. But none of the agencies posted all of the information required by FOIA. District officials also began publishing more non-confidential documents online this summer, following an April executive order from Bowser. The District also has a new city data portal, Open Data DC, and a central meeting calendar. Barney Krucoff, the District’s chief data officer, said the government started publishing facts about FOIA requests in September, including how long the request took to be processed and whether or not it was granted. He said the Metropolitan Police Department gets the most requests. While some open-government advocates say the city’s FOIA law helps provide the information the public needs, not everyone agrees. Attorney Fritz Mulhauser, a board member and co-chair of the Legal Committee for the D.C. Open Government Coalition, told the Workshop that the list of information required to be posted under the law is too narrow. Other cities are starting to put as much information as possible online without a law specifying which elements need to be made public for each agency, Mulhauser said. In September, the District started posting basic facts about all FOIA requests that come through FOIAXpress, said Barney Krucoff, the District’s chief data officer. These basics include how many days it took for requests to be processed, whether the request was granted, to which office the request was made and the type of requestor. But the site doesn’t include everything. The description of the request is not posted because officials say it could contain personally identifiable information, such as names, addresses and Social Security numbers, Krucoff said. He said that an automated tool to mask personal information would allow the agency to post the descriptions without disclosing certain detaIls. Even without those details, the information shows interesting trends about FOIA in the District. Theo Goetemann, a data visualization fellow at National Journal’s Presentation Center, used the data to create a dashboard logging how quickly the District responds to public requests for information. For example, he found it took about 25 days on average for the Metropolitan Police Department, which receives the most FOIA requests, to respond to the 852 requests it received between 2015 and 2017. Adam Marshall, an attorney with the Reporters Committee for Freedom of the Press, said agencies need to put frequently requested records online. The Workshop found that fewer than 10 percent of District agencies put their frequently requested records online despite the fact that FOIA requires the online publication of these documents. Over that last eight years, interest in arming teachers with guns is the result of school shootings. News coverage and Google searches reflect these trends.